I find that there is a great difference between doubt and disbelief. Doubt, to me, means 'I cannot believe something in my mind, yet I will accept it as Truth'. Disbelief, to me, means 'I cannot believe something in my mind, and I will not accept it as Truth'. Silence does not answer whether our protagonist had Doubt or Disbelief. 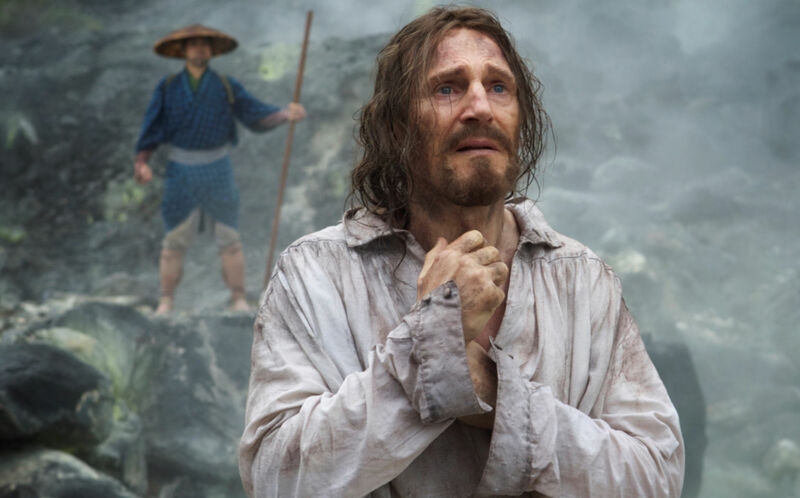 As a meditation on faith and its perils, it is another Martin Scorsese masterwork. As a film, it will try both men's souls and their patience. 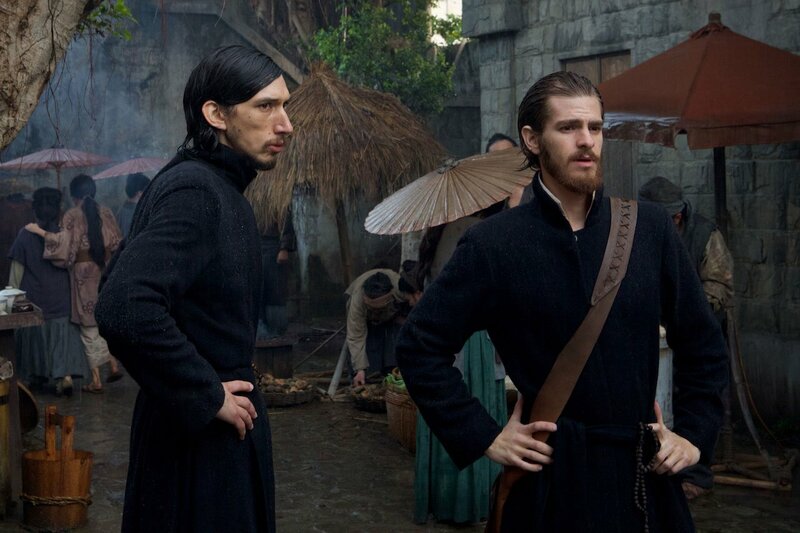 Two Portuguese Jesuits, Father Rodrigues (Andrew Garfield) and Father Garupe (Adam Driver) have received news that their mentor, Father Ferreira (Liam Neeson) has committed apostasy in Japan. Ferreira has been one of the few remaining missionaries in the Land of the Rising Sun, a nation whose leadership (the Tokugawa shogunate) fiercely hostile to the Gospel. Any Japanese who is found to be a follower of The Way is tortured unless he or she renounces The Faith. The most visible example of that is by stepping on an image of Christ or Mary, Mother of Christ. Ferreira, it has been reported, has renounced the Faith. Against the advise and judgment of their superior, Father Valignano (Ciaran Hinds), Rodrigues and Garupe go to Japan, in secret, to find Ferreira and discover the truth. The journey to Nippon is hard, with the two Jesuits finding a most unreliable guide: Kichiro (Yosuke Kobusuka), who may or may not be an alcoholic, and who may or may not be a Christian. The local peasants and fishermen, all secret Christians, welcome the two Catholic priests, eager for the Sacraments so long denied them. Rodrigues and Garupe find themselves both guests and prisoners, for they cannot go openly in a nation hostile to not just Christianity but Westerners as well. Eventually, they are discovered, but not before Garupe and Rodrigues agree to split up to continue their search. Every time there is some kind of betrayal of the priests to the Japanese, Kichiro is at the center of it. Every time though, Kichiro tearfully begs confession of Rodrigues and the absolution it gives. Once Rodrigues comes into Japanese hands, he must match wits and stave off The Old Samurai, whom he discovers is the Governor of the Province, Inoue (Issei Ogata), who pushes for Rodrigues to renounce his own faith, which Inoue insists cannot flower in 'the swamp of Japan'. Rodrigues holds firm, though he wonders how God could let those who are so devoted to Him suffer so cruelly without recourse. Inoue has Rodrigues see other Japanese Christians tortured, even though they have apostatized, and to his horror, Garupe is with them. Garupe has held firm, but the Christians will be killed precisely because Garupe refuses to denounce his God (the only way the others can be saved). Garupe drowns trying to save one, and Rodrigues is heartbroken, angry, bitter, but he still will not give in. Eventually, Inoue arranges for Rodrigues and Ferreira to meet. Rodrigues finds that Ferreira has indeed rejected the Christian God, turned to the wisdom of Buddhism, and confirms that Christianity cannot fit into Japanese culture. Not only does he push Rodrigues to renounce Christ, but he also tells him that the faith of the peasants is a false one, for to them, the Western Christ is still a mystery to them. Rodrigues is brought to witness a cruel torture of captured Japanese Christians, and in desperation, urges them to apostatize. Ferreira tells him they already have, several times over. Inoue wants RODRIGUES to apostatize, to renounce his faith to save them. Ferreira adds that for Rodrigues to keep his faith at the cost of others life is the true apostasy, and that it is vanity to compare his own suffering with that of Jesus Christ. Rodrigues, at long last, apostatizes. Now both Rodrigues and Ferreira, adopting Japanese names, customs, and even wives (all inherited from dead vassals of Inoue), work to keep Christian symbols and ideas out of Japan by examining everything that comes from the Dutch in Nagasaki (the only port where Westerners are permitted). Kichiro himself becomes Rodrigues' servant, and it is found years later that he had a Christian symbol on him. He is quickly sent away, with Rodrigues apparently not caring. Upon Rodrigues' own death, even his body is carefully watched for any signs that he kept true to his apostasy. Only a brief visit from his wife to his body is permitted. As we see him buried in the Buddhist manner, his body burned, we look to see in his hands, a tiny crucifix, one the authorities never managed to find. I don't think anyone of faith, regardless of what faith he/she has, hasn't had a 'dark night of the soul', a time when they struggled over whether what they believed was true or not. Silence, to its credit, looks at the cost faith has on both an individual and those that the individual comes into contact with. In this Apocalypse of The Faith Now, our two figures (or primarily Rodrigues) go in search of our mad Kurtz, only to find, like our mad Colonel, that he has become something other than what he started out as, someone who has 'gone native' and left the bounds of Western views to embrace the wisdom of the East. I just wish that Scorsese had not done what I find rather ridiculous whenever someone has 'deep thoughts'. It is this idea of 'whispering'. Garfield's dialogues, even monologues, almost always consist of whispering, or at least speaking softly. It doesn't matter whether it is internal or external: there is a very hushed, muted verbal nature to Silence, and that displeases me because it signals that the film does not trust me to understand. The good Padre whispers his doubts of God's existence as He does not answer the prayers of His Japanese flock. He is disturbed by God's Silence. He is irritated by the idea that Kichiro can keep coming to him for absolution whenever he sins (he let his family burn alive to save himself when they refused to renounce Jesus, and helped the Japanese find Rodrigues for his own three hundred pieces of silver...though I'm sure any symbolism was purely coincidental). When Rodrigues finally and tearfully apostatizes, we find that it is dawning, and in the distance, we can hear a rooster crow. I'm sure that moment was coincidental too. 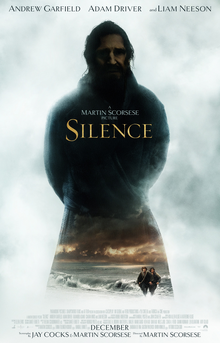 Perhaps it's the Protestant in me, but I think one has to be of a Catholic view (which Scorsese was brought up in) to hold some of the ideas of Silence. A Protestant would not put much stake in iconography (after all, Martin Luther and John Calvin were particularly appalled by images and knowing them would have delighted in stomping over pictures of Mary). Yet I digress. I find it hopelessly irritating whenever we have endless moments of whispering. It, to me, is too much artifice to drive home a point I can just as easily get without whispers, careless or otherwise. Let us move on to the performances. Alas, Andrew Garfield, how I am souring on you. I cannot say I was a fan of Garfield (with the possible exception of The Social Network, maybe Never Let Me Go). I have avoided Hacksaw Ridge for many reasons, one of them being I cannot believe Garfield's Southern accent. Silence shows he can't handle a Portuguese one either (and more to the point, do we really need for him or Driver to have one). Neeson didn't bother to have one, which makes the Irishman the most authentic Portuguese person there. It doesn't help that Garfield's accent comes and goes. Driver kept his, which wasn't the greatest but at least he wasn't on screen that long to make it sound stranger than it already did. The best performance, however, is that of Ogata as the shrewd governor, one who pushes in manners cruel and kind. His frustration at the young priest's stubbornness is at times almost hilarious (at one point, he appears to almost literally deflate at the verbal sparring between the two when he can't get Rodrigues to see reason). Silence is visually splendid, with very little to no score to back it up (and which makes the whispering all the more noticeable). Nothing can take away from the passion Scorsese had with the film, his technical craftsmanship in it. I could even see little callbacks to Kurosawa films like RAN. However, Silence felt a bit remote, removed, aloof, distant. It is a very slow-moving film. This isn't a slam, but I suspect there will be people who will find the pace very frustrating. Again, this isn't a slam on Silence. It is a warning. It is a very visually splendid film, one that takes its time getting from one point to another. Even some of the questions it asks aren't answered (such as whether Kichijiro was really a Christian or just kept wavering between faith and folly). I think we were meant to answer those questions ourselves, whether Rodrigues' faith was truly worn down, whether he did repent and return to Christ, whether he ever truly left, or whether he held on to objects rather than the actual Truth behind the objects. I respect Silence. It asks deep questions on and of faith, of the morality of holding to ideals if it means others will perish for them (as Inoue snidely tells Rodrigues, "The price for your glory is their suffering"). It questions whether the faith of people is real or imagined. It is a visually arresting film. However, people who go into Silence should steady themselves through a film that might prove very slow for them, sometimes a bit overdone with symbolism, and with a lot of whispering. They might also find some not-terrible but not-great performances and shaky accents (though again, to be fair, I'm not an Andrew Garfield fan, so that might make me slightly prejudiced). While watching, I was reminded that 'to live is Christ, to die is gain' (Philippians 1:21). I cannot say whether those claiming the name of Christ in Tokugawa-Era Japan were true martyrs or not. However, I find that I cannot fully embrace Silence.